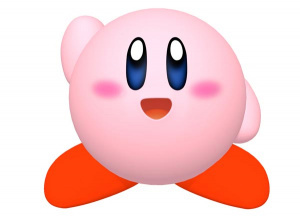 Last year's Kirby's Epic Yarn was good and all, but removing the pink puff ball's iconic sucking ability put some gamers off. The video for the new Kirby Wii (tentative title), then, will draw many more players in, featuring as it does a huge amount of sucking. We don't know much about the plot at the moment but we'd imagine something to do with evil, trees, King Dedede and securing the future happiness of the world. Perhaps. Kirby Wii, or whatever its full name will be, is scheduled for release this Fall. Wow! Traditional gameplay! New abilities! 4-player mulitplayer! These visuals are slick! Lookin' good, Kirby, lookin' good. We getting rushed for headlines, James? Looks super easy but fun. I'm excited for the multiplayer, but other than that I think Kirby is starting to get stale. I'd love it if the next one was a 3D platformer. This looks really fantastic! I can't wait! Admittedly I forgot about this one until I saw it on Nintendo Channel. Was it in the presentation today, must've blinked? 4 player makes me happy. I have no past relationship with Kirby except Smash Brothers and Epic Yarn but I finally feel like there's still a Wii game I want. That looked amazing. I'm totally buying this. Day 1 buy. The multiplayer looks more traditional and cooperative than NSMBW. I'm overwhelmed by E3. I can play as meta knight!!!!!!!!!!! This game is worth a trillion bucks(in my opinion)! Old school meets new school I think I'm in love. @Metakirby19: May I have the honor of selling you a copy? Kirby: We're out of options. I'm going to have to use the rest of you as ammo. Looks awesome! As visually gorgeous as Epic Yarn looked, along with it's fluffy whimsical soundtrack, it was just too easy. It was still a blast, but there was nothing remotely rewarding, inense or satisfying about it. THIS on the other hand looks kick ! Why didn't they show this in the press conference! it looks awesome! Lookin' good. Wii love 2D platformers! Awww, Kirby is the most adorable thing in the world. Whispy Woods! =D Thisgame looks really awesome. Ultra sword ftw! It's like Kirby 64. I LOVED Kirby 64! I just hope it's easier to play cooperatively than Epic Yarn, where you keep picking up the other character every few seconds. This looks cool, why wasn't it in the press conference? Wait a second... I've seen this before.... but where? Joystiq? YES! YESSSSS! THE GLORY OF SUPER STAR HAS FINALLY RETURNED!! Oh HAL why did it take you soo long?? Wow, that looks really impressive! I loved Kirby 64, I wonder if you are allowed to mix powers? Also, using your friends as ammo? That's a Waddle DO right there. That was AWESOME! This will make up for my disappointment at Epic Yarn. 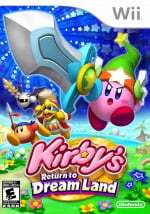 Co-op and classic Kirby? Cool. Also....LIMIT BREAK with the sword.